If you’re a freelancer or you work with freelancers frequently, then you know that a professional can charge for project execution in two ways. Either they charge hourly until the project is complete, or they charge a one time project fee. While hourly charges are preferred by many freelancers, this is a risky proposition for many business owners. They have little or no insight into whether or not the freelancer is wasting valuable time getting the project completed. Time tracking software gives the business owner insight into how the freelancers is spending his time while working on the project. Business owners have the peace of mind to know that they are not being billed while the freelancer isn’t working on the project. 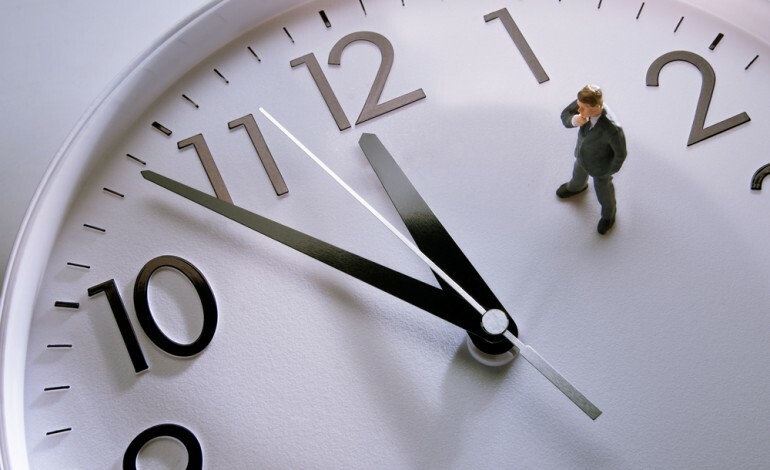 The time tracking software market has several options for business owners to choose from. This gives entrepreneurs the ability to choose a tool that will best suit their needs. Time tracking programs are also ideal for the needs of companies that are interested in boosting employee productivity. Through the creation of detailed reports, these programs provide information about the activities that require the most time and the efficiency of different teams. In this article, we are going to take a look at three time manage tools that will help boost the productivity of your team and ensure that your freelancers aren’t wasting your money while completing projects. These tools are: Harvest, Toggl, and Time Doctor (that’s us!). We have provided a comprehensive review so you can see a breakdown of these three products so you can determine which is best for you and your business. Before moving on to the payment options, plans and features of the three products, it’s good idea to acquaint ourselves with some of the main characteristics of each. Harvest is the first popular time tracking option that I want to introduce to you in order to help you boost productivity or monitor the execution of a project. Harvest allows entrepreneurs to generate a variety of productivity reports so that they can make decisions and procedural changes that will lead to enhanced output in the future. Besides its time tracking features, Harvest has additional tools in its platform to help entrepreneurs better manage their business. These tools include: invoicing and simplified payments when projects are completed, the ability to integrate Harvest with other business apps, as well as free iPhone and Android apps. Additionally, Harvest’s intuitive interface makes navigating the software very easy for busy entrepreneurs. The design of the interface allows them to easily consume data concerning the productivity of their employees and freelancers. The tool allows them to see things like latest hours logged and the newest projects and invoices generated for each project. There are project reports, expense reports and time sheets that give the business owner insight into what work has been completed. The second product included in this review is also user-friendly. Toggl is a time tracker that’s mainly characterized by simplicity and accuracy. These are the two strongest selling points that Toggl uses to differentiate itself from other options in the marketplace. There are “play” and “pause” buttons which give the freelancer the ability to take a break from the project without billing the business owner for time spent not working. Once the job is done, Toggl enables business owners to generate weekly and monthly activity reports. These reports can be classified according to client, project or total number of hours logged. Toggl generates useful graphs that give insight into employee productivity and the time spent to complete each task. These reports can easily be exported to PDF files so you can share them with clients or business partners. Time Doctor is the final time tracking software that we want to introduce you to in this article. When we created this product, we wanted to have a user-friendly and reliable tool that business owners can set up and use without a learning curve. In addition, our product comes with a lightweight client for both Mac and PC, enabling accurate tracking no matter which hardware platform your company uses. Because Time Doctor is able to accurately track the number of hours required to complete a task, it is a valuable tool for HR professionals and business owners to determine whether or not time is spent efficiently when completing a task. All of this data can be generated in reports that make productivity analysis easy to perform. While we get to witness a number of businesses increase the productivity of their employees and freelancers, one of our favorite stories is an agency owner who used Time Doctor to double the productivity of his lead developer in three months. Screenshot capabilities and popup notifications can be used both for tracking purposes and as reminders. The reminders that appear periodically on the screen are ideal for boosting productivity and making sure that workers are on track. Time Doctor features a range of tracking and monitoring options such as website and application monitoring and screenshot recording. These tools are easy to access through drop-down menus reducing the learning curve for any individuals who wants to get started with a time tracking software immediately. All three of the time tracking programs come with a free trial, which gives you a convenient opportunity to determine which tool is the right tool for your business. Now, we will cover the differences in the pricing plans to help you make a decision about which software is right for your business. Because there are a few different options, the Harvest pricing plan offers some flexibility and convenience for business owners. 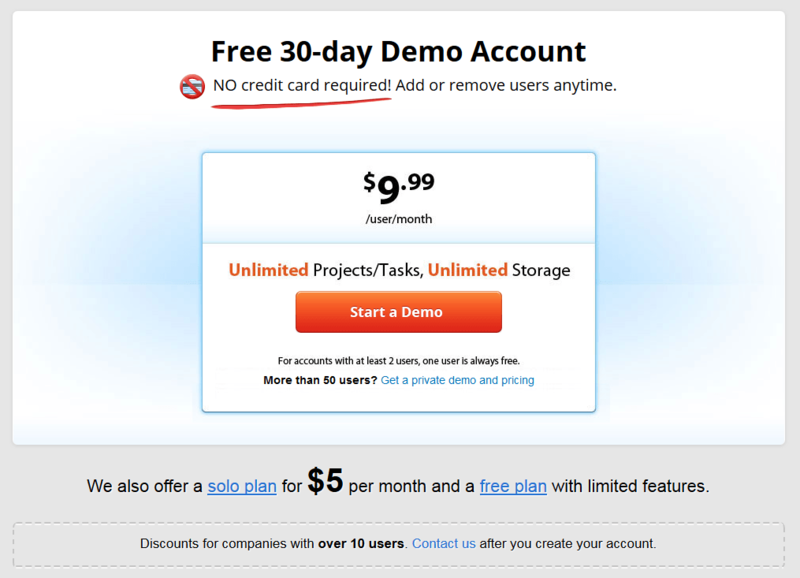 The business plan starts at $99/month (Starts at 10 users). Each additional user costs 10 dollars per month. Toggl allows business owners to create a free account for teams of up to five people and can be used to track unlimited projects. You can access the free plan one of two ways: Either by entering your name and email address, or you can log in with a Google account. The business plan costs $49/user/month. Purchasing the business plan allows you to access some features that are not availble with the pro plan. Time Doctor comes with a 30-day free trial, as well as with a free plan that gives users access to limited features. If you’d like to test the free plan, you’ll simply need to enter some basic data. No credit card information will be required. If you’re a representative of a company that has 10 or more employees in need of a time tracking solution, you’re entitled to a special discount. Contacting the Time Doctor support team will give you a better idea about the opportunity. We’ll now go into a detailed feature comparison so that you can determine which feature set is best suited for your business. Combined with the price of each product, you’ll be able to accurately determine which time tracking solution to try.. . For a quick comparison, check out the table below where you can compare the features at a glance. Time tracking software is available either through the use of a client that’s downloaded on the computer or a web-based app. 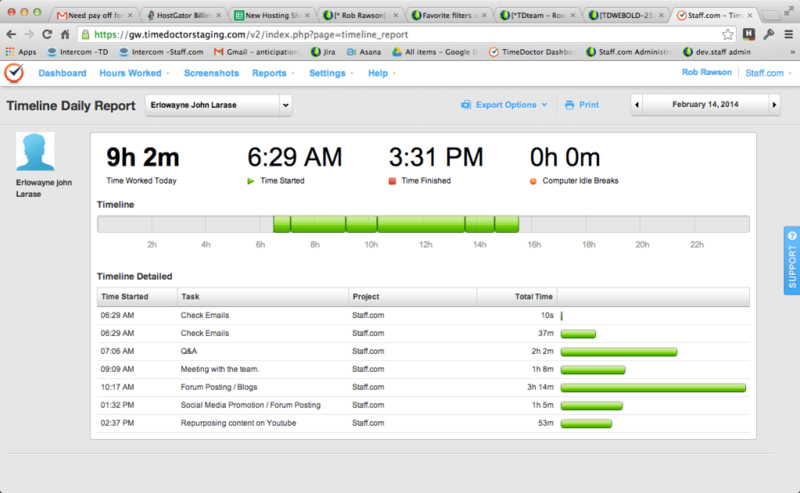 Harvest and Toggl both have web-based time tracking features. Time Doctor doesn’t enable web-based time tracking, which some freelancers consider to be a disadvantage. Some people are extremely particular about the software that they install on their PC. But installing a client gives the business owner the ability to track apps and websites that the freelancer goes to. Something that isn’t possible with a cloud based app. 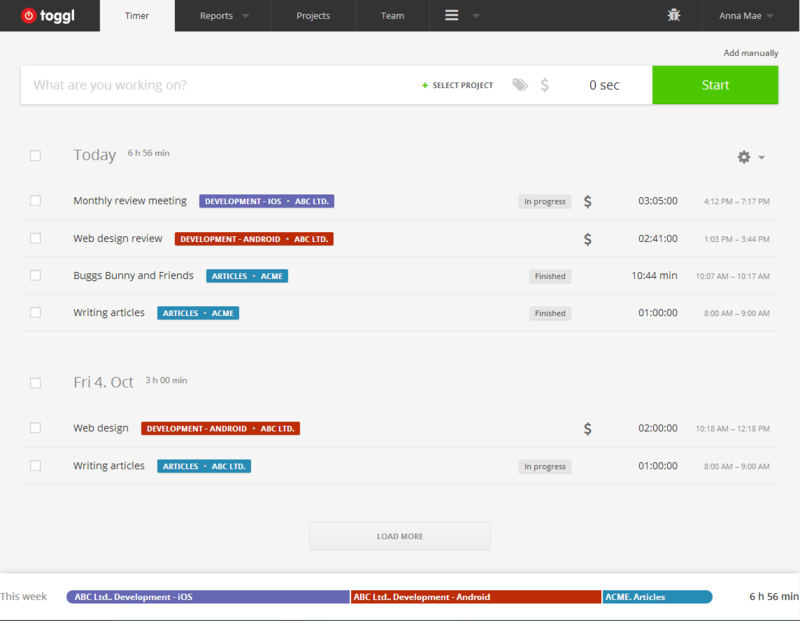 Toggl is the only one of the three products that features both online and desktop-based time tracking. When it comes to making sure that the job has been done, some clients would like evidence that the hours billed had actually been dedicated to project completion. Screen grabs are an ideal opportunity for giving clients evidence. Time Doctor is capable of capturing what’s currently happening on the screen and whether the professional is working (or dedicating precious time to another activity). 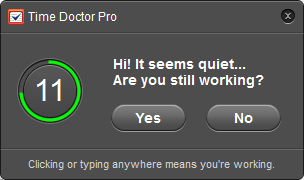 Of all three time tracking programs, Time Doctor is the only one that comes with such a feature. It’s also capable of application and website tracking, boosting accountability even further. Freelancers that work with clients often may find that the lack of screenshot recording in Harvest and Toggl to be a major disadvantage. By showing customers what activities the time has been dedicated to, freelancers can use this proof of work to build long-term professional relationships with their clients that are based on mutual respect. In addition to screenshot recording, Time Doctor has website and app tracking. This tool is beneficial to both the business owner and the freelancer. The business owner can analyze whether or not the freelancer is doing the job at hand, or if he is veering off task by checking his social media accounts. And the freelancer will have indisputable proof that all time spent and hours billed are 100% accurate. This feature along with the screen recording feature, are used extensively to build trust-based partnerships and a high level of accountability during the project execution process. All three of the time tracking programs come with offline time tracking capabilities. This is particularly important for tracking activities that don’t involve the use of Internet, such as meetings, or for tracking time in the case of connectivity problems. All three of the programs are also equipped with mobile time tracking capabilities. When it comes to vacation or leave tracking, only Time Doctor and Harvest have such features. Toggl isn’t equipped with such additional functionalities. All three of the programs come with website/application monitoring. The tool is of uttermost importance for boosting productivity, whether it comes to time tracking inside a corporation or during the execution of a freelance project. Finally, all three of the tools enable manual addition of time and the creation of absent/late reports. Harvest, Toggl, and Time Doctor each have the ability to track multiple currencies, which is beneficial for companies with employees and freelancers in several countries. Toggl and Time Doctor are capable of recording exact times an employee works. For instance, you’ll know if the employee is working from 11AM – 3PM. Harvest, on the other hand, records the amount of time dedicated to work but it doesn’t provide information about when the work has been completed. For some companies, exact time recording may be important for boosting productivity. The final characteristic that will need to be examined is customer support. No matter how great a product is, an emergency can happen. The rapid and adequate response of the customer support team will be of paramount importance in such instances. Harvest features both email and phone support for their customers. Toggl gives its customers access to free email support and a large library of detailed articles about using the time tracking software. Finally, Time Doctor gives its customers access to email support and a detailed library of how-to/getting started articles. Choosing the right time tracking software for the needs of your business will depend mainly on the size of your company, the types of projects you deal with and the amount of money you can dedicate to the purchase. Some company owners prefer Harvest due to the fact that the time tracking platform comes with integrated invoicing features. Anyone that’s looking for a solution offer more than one service will most definitely enjoy this characteristic of Harvest. Others would like a simpler solution that focuses on one task, namely user-friendly time tracking. Having a good idea about the way in which the software is going to be used will be determining for the selection. Doing a side by side comparison will be the best option for choosing the right software (see the table below). All three of the reviewed products come with a free trial, allowing you to determine which tool will be best suited for your business. This will allow you to determine whether or not the software is easy to use while providing you with the features that you seek. Boosting productivity is of uttermost importance for ensuring business success. Choosing a functional time tracking option will be one of the simplest possibilities for analyzing current performance and making some important decisions for the future. I am extremely satisfied by SCREENish time tracking software and I would like to recommend it! Compared to Harvest and Toggl, Timedoctor is without any doubt the better software to increase productivity.Anyway, it has to be said, that there are also several intranet solutions out there, who can contribute to the productivity of your business.In the end, every company has to make an individual decision!